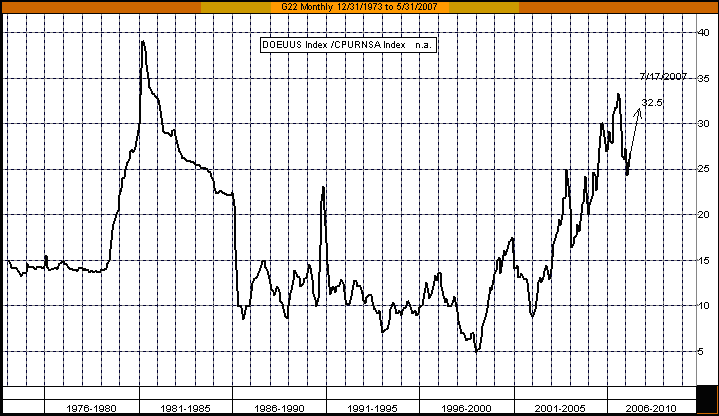 Stock markets have been quite strong globally, as you can see from the performance numbers shown above. Unfortunately, for Canadians who tend to diversify their investments abroad (under the advice of so many investment counsellors), the returns achieved in Canadian dollar terms are quite abysmal since the beginning of the year. 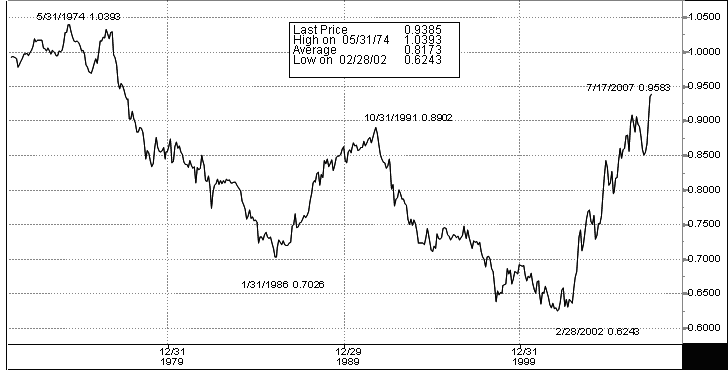 It is hard to believe that the Loonie staged a rally of more than 50% over a period of 5 years and managed to recoup all of its losses since the high point of US$ 0.8902 in October 1991. It is actually about to challenge parity soon. This tremendous run is mostly due to the ever increasing demand for our commodities coupled with a depreciating US dollar. The following table summarizes the price performance of the main indices for the second quarter and the first half of 2007. The global economy seems to be moving along quite nicely. In fact, the US economy is actually growing at a slower pace as consumers retrench after the sub-prime mortgage market implosion. Although experts are still tallying the extent of the damage to consumer credit, we believe that the overall impact should be fairly contained. Meanwhile, the rest of the world is expanding quite strongly, showing that it is less and less dependent on U.S. demand. As you can see, the oil price is still below the all time record reached during the late 70s early 80s crisis when inflation ran amok (on an inflation-adjusted basis). Oil consumption as a percentage of overall spending has decreased dramatically over the last 25 years, thanks to new technologies and productivity improvements. The current Mergers and Acquisitions (M & A) boom has been front and center in major magazines and newspapers. Although comparable to other M & A periods, this one is led by hedge funds and private equity firms. Now, the private equity firms are going public: Blackstone Group raised just over US$ 4 billion in March, followed by Fortress Investment Group and Kohlberg Kravis Roberts & Co. Even the Saudi Prince’s holding Company is trying to raise US$ 17.6 billion by selling about 30% of its shares. We view these events as the unintended consequences of the policies imposed by the SEC in the post Enron era, symbolized by the Sarbanes-Oxley Act of 2002 (SOX), also known as the Public Company Accounting Reform and Investor Protection Act of 2002. Management of public companies and their external auditors are being scrutinized and made liable for inaccurate financial disclosures. While there is no question that, broadly speaking, SOX was necessary, the debate about its cost-benefit analysis continues and its requirements softened in recent months. We happen to think that the majority of management is honest and conscientious as are boards of directors in their fiduciary duties. However, when potential liabilities and litigations increase, most managers turn defensive. They surround themselves with lawyers to protect themselves against other lawyers, stop thinking what is best for the firm in the long-run and hesitate in taking reasonable business risks to the detriment of shareholders in the longer term. Meanwhile, private equity can offer good management teams a safer haven to operate their businesses with a longer term view and a lot less legal constraints imposed by SOX. Basically, one reporting shareholder (generally, more knowledgeable), no analyst conference, no daily stock price fluctuations, and above all, no potential class action lawsuits from shareholders. We believe this is the main reason why most managers of public companies recommend shareholders to accept buy-out offers from private equity firms. Has anybody ever wondered why, in some cases, management recommends existing shareholders to sell-out to private equity interests while at the same time, opt to keep their interests alongside the “new” private equity firm? It is like saying: “I think you’re getting a great deal so you should cash out, but I am staying, because I would rather report to one shareholder”. Don’t you think they know the value of the firm more than you do? We think a lot of the current acquisition boom is fuelled by the above-mentioned reason and also by the fact that the financial markets are flush with liquidity. The unfortunate consequence is that small investors will eventually have less choice amongst a smaller pool of stocks and if the trend continues, they might soon find themselves investing in companies that own many different companies such as conglomerates. Management, guilty or not, is fired. Those found guilty might go to jail for a short while and others end up with severance bonuses approved by the new board of directors. New management negotiates a settlement to put the bad news behind them so that they may address the core business, and rightfully so. Settlement is reached. One group of shareholders, usually the current ones, will pay another group of shareholders which are represented by legal counsel in the class action suit, a mutually agreed upon sum. Oh! And of course, after the deduction of huge amounts of legal fees which sometimes represent up to 40% of the settlement amount. In conclusion, it seems to us like some innocent shareholders are paying, let’s say, $10 million for something they did not do, while the receiving shareholders are only getting $6 million (i.e. 40% for lawyers) for something they did not do either. Isn’t it insane that as investors, we agree to these settlements? (By the way, self interest behavior makes us agree to these settlements, a human characteristic that most lawyers know all so well in order to exploit to their benefits, but this is a topic for another day…). It is difficult for us to quantify the current M & A boom relative to prior cycles due to lack of long term data. However, we do know that the current wave seems comparable to others led by private equity. How will it all end? While the names were different each cycle, all the other periods ended poorly. Whether they ended due to Fed tightening, excessive optimism or a bear market may be a “chicken or the egg” argument – which caused which? But the fact remains that these cycles are bullish on the way up, but high risk at their peak. Given today’s financial engineering, derivatives, the debt bubble, and the huge amount of dollars available in this cycle, we would guess that should things turn sour, we would expect devastation for the players concerned. On a brighter note, in a capitalist society, in most cases, assets just change hands and value, but they do not really disappear. For example, think of a building: the builder could declare bankruptcy during an economic recession. The asset will then be sold to another owner who might or might not survive the recession. But it does not really matter because eventually, some investor will pay a cheap enough price in order to make money. In the meantime, the asset has been built and it generates economic activity, i.e. GDP growth. In other cases, economists term them as creative destruction: businesses disappear all the time due to inefficiencies or changes in technology only to be replaced by more efficient and more profitable ones. So, it always pays to be optimistic but with a cautionary note.